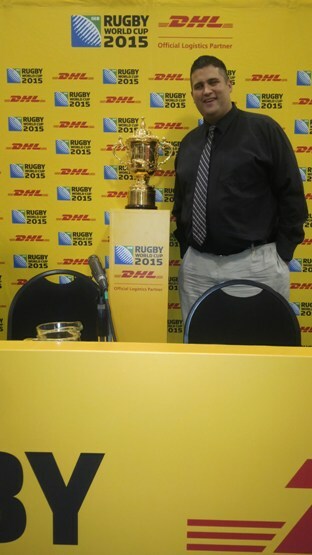 This week it has been announced the DHL will be the official logistics partner of the 2015 Rugby World Cup. In true DHL fashion the announcement was a classy acknowledgement to the history of the Web Ellis Trophy and of course the Rugby World Cup. I of course headed off to Ellis Park, the home of one of the greatest rugby moments in South African history for the announcement and was met immediately with the Web Ellis Trophy. I of course did not touch it, as tradition states that only previous winners can get their hands on the coveted trophy. It’s amazing that a trophy can cause the kind of goosebumps that it does, but I was as excited as a teenage girl waiting outside a Justin Bieber concert. 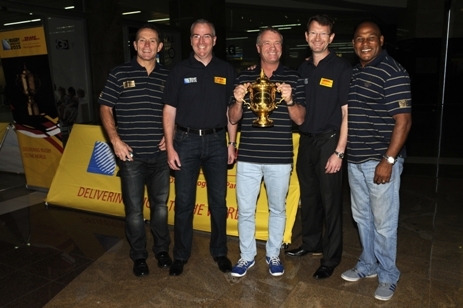 As part of the announcement DHL were taking the trophy on a whirlwind tour, delivering it to each of the previous winning countries before taking it back to its final destination at IRB headquarters in Dublin. The tour was led by DHL Ambassador and 1987 World Cup winner, Grant Fox from New Zealand. The legendary flyhalf was reminiscent of the World Cup win in 1987 stating that the team enjoyed a bit of a party after winning, before being back at work on Monday. As Official Logistics Partner, DHL will be responsible for the transportation of Tournament and team equipment from around the world to the 13 match venues in England. The equipment to be transported will include, for example, an estimated 1,400 rugby balls, 200 kicking tees and 200 tackle bags. Hennie Heymans, Managing Director of DHL Express Africa addressed us next stating: “We are very excited to be joining forces once again with the IRB to deliver Rugby World Cup 2015, DHL sees tremendous synergies between a sport that is built on teamwork, passion and a will to win and the values that we strive to bring to life every day for our customers. We are actively involved in Rugby the world over, both through flagship global partnerships such as this one and through our participation in local clubs and grassroots initiatives. We will be working hard behind the scenes to support and match the world-class performance that fans will surely be treated to on the pitch.” Of course this was all after asking the Sharks supporters to leave the room. Another highlight of the announcement was the presence of some of the biggest legends in Springbok rugby history. The likes of Joel Stransky, Chester Williams, Hannes Strydom, Adriaan Richter, James Dalton, James Small, Wikus van Heerden, Japie Mulder, Hennie le Roux, Ian McIntosh, Gary Botha and Stefan Terblanche were all in attendance and were joined by the ailing Joost van der Westhuizen. The legends are still very much a pack of boys and spent time reliving the greatest moments of their careers, while having a dig at each other. DHL once again delivered an exceptional announcement ahead of an exceptional partnership and now will have the simply exceptional job of delivering the trophy back to South Africa after RWC 2015. You know you want to! Is Domestic One Day Cricket losing its edge?